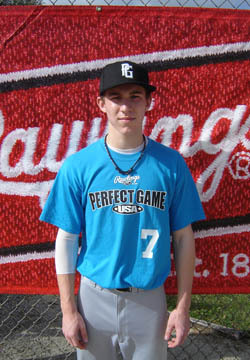 Ben Currie is a 2010 RHP/OF with a 6'0'', 160 lb. frame from Clemmons, NC who attends West Forsyth HS. Slender build with lean strength. Arm circle in back, high 3/4's release point, some cross body at release, arm works well out front, some velocity projection. FB steady 82-84 mph, some sink down low. SL best pitch, good depth in mid 70's, sharp quick break at times, needs more consistency, commanded both pitches well, got quick outs and showed pitchability. Should keep improving. Good student.